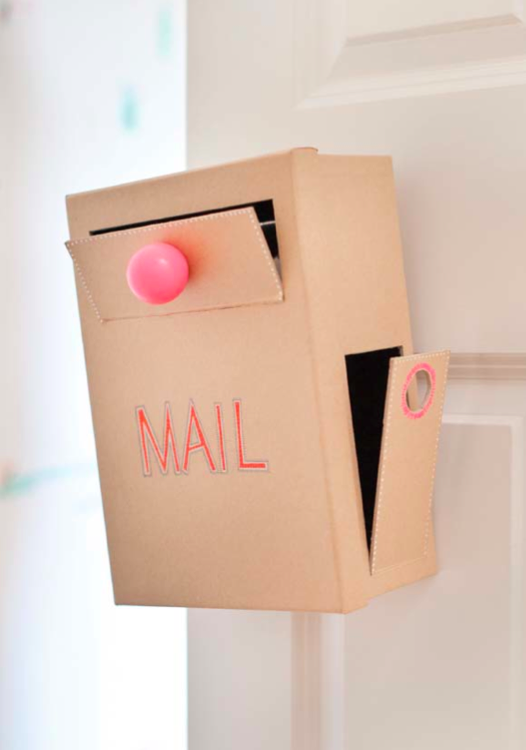 Learn how to make this adorable doorknob mailbox from the fun and funky crafts book You Are Awesome: 21 Crafts to Make You Happy. I came across Abbey Hendrickson’s amazing blog, Aesthetic Outburst while searching for easy projects to do with Little M. The blog details Abbey’s crafts projects and life with her husband and their adorable kids. In a nutshell, they moved back to Abbey’s hometown in rural New York and she found herself at home, with two kids, struggling to find ways to keep them (and herself) occupied every day. So she started working on crafts projects, everything from elaborate forts to cardboard spaceships to woodland animal costumes. Abbey then decided to start sharing these projects, for free, with her readers. The result is an incredible blog, filled with innovative and fun projects for the whole family. Her writing style is fresh and down-to-earth and her projects are so awesome (there is no other word to describe them), that you can’t help but want to try them yourself. 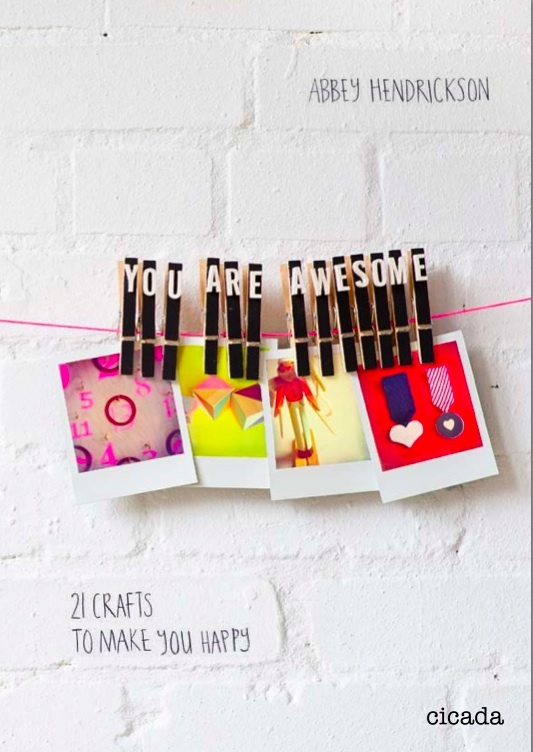 I love Abbey’s new book, You Are Awesome: 21 Crafts to Make You Happy. The craft projects are all carefully explained, with simple instructions and pictures. 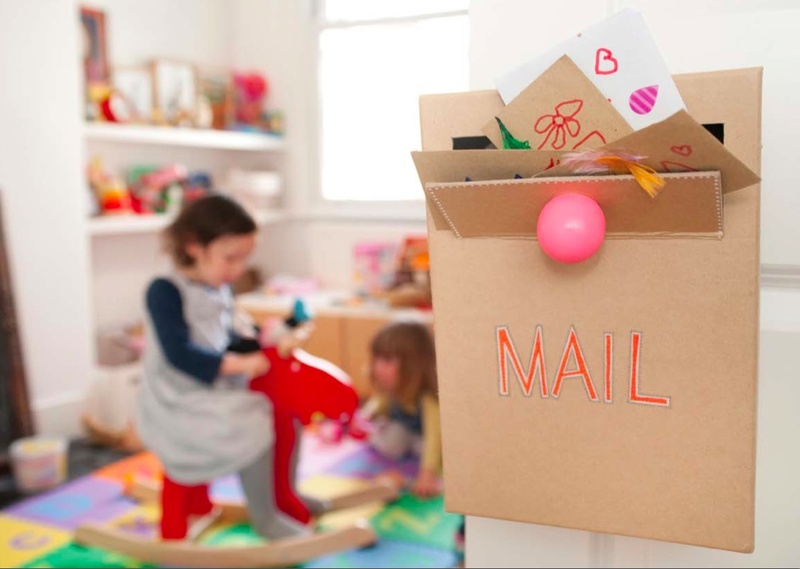 My favorite projects are the ribbon chalkboard (great for a nursery), the ring toss (a fun game for the family) and the doorknob mailbox, which would be perfect for Valentine’s day to collect all the little letters and notes. Even though I enjoy DIY projects, these days I lack the time, focus and materials to pull off anything too intricate or complicated. Abbey’s book is wonderful because it makes me feel like I am able to successfully complete an entire crafts project – from start to finish – and best of all, Little M can help with some of them so we both feel like we are being crafty and can enjoy the finished project together. Read below for step-by-step instructions for how to make your very own doorknob mailbox from You Are Awesome: 21 Crafts to Make You Happy. Pick up your copy of the book here. Hang this vintage-inspired mailbox on a doorknob and deliver sweet messages to your favorite person through the door on the front. They’ll love retrieving your notes through the pull-down door on the side. a 3″ high rectangle that is 3⁄4″ from each side and 1″ from the top. 5″ high rectangle that is 1⁄2″ from each side and 1⁄2″ from the bottom. 3. Trace the 1⁄2″ circle template approximately 1⁄2″ from the top of the side door. is where the doorknob will slot into the mailbox. Carefully cut it out with the exacto knife. 5. On the side of the box, use the exacto knife to cut the two sides and top of the door, and the circle. 6. On the front of the box, cut the two sides and top of the door. 7. Place the ruler along the bottom of the doors on the front and side, and use the bone folder to score. Gently bend to make the doors open and close. 8. Paint the wood knob and allow to dry. 9. Center the wood knob on the front door and glue. Allow to dry. 10. Decorate the mailbox with acrylic and puff paint and allow to dry. 11. Glue the box closed and allow to dry before hanging the mailbox on a doorknob. Photos and project from You Are Awesome: 21 Crafts to Make You Happy by Abbey Hendrickson. This a such a cute little make. I might try making it for my boyfriend’s nieces to encourage them to write letters/notes to me. They’re at that age where they’re distracted in seconds when they’re supposed to be doing work. So making it a sort of game surely will help!! Thanks for sharing! That is a wonderful idea! You’re right, I think it will encourage them to write because they can “post” the letters themselves. I hope they like it!